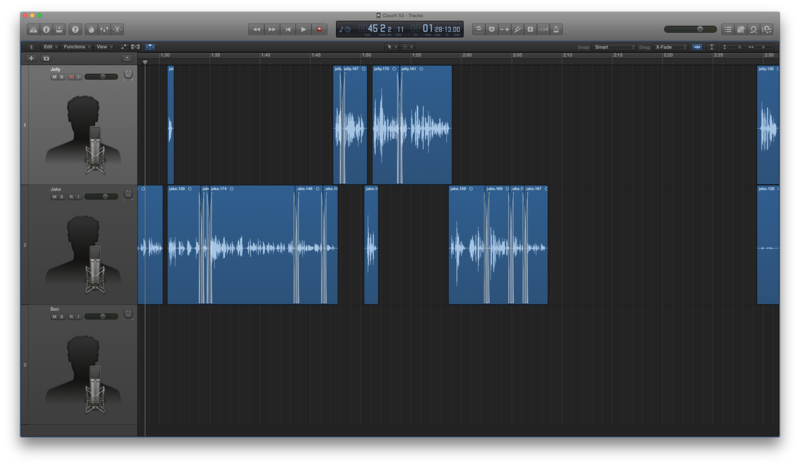 The unedited version of Mobile Couch 53 in Logic Pro X. 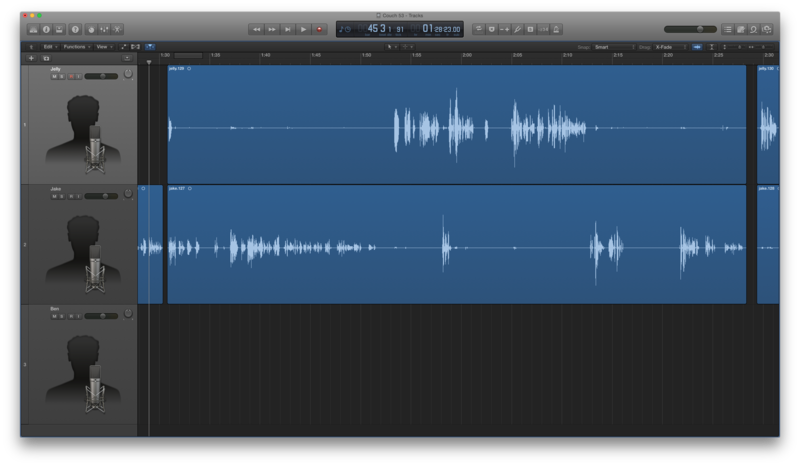 For this process, I use Apple’s Logic Pro X, which is essentially a grown-up (and relatively expensive) version of Garageband. For a long time, I used Audacity for this part of the process as well as cleaning and processing my audio files. The key to editing is really just to have an editing tool capable of multiple tracks, as this will allow you to edit each host individually. For the purposes of simplicity, I’ll explain what I’m doing in Logic Pro on OS X, but most of the concepts should translate to other multi-track editors relatively easily. The first, and most basic, step is to bring in your pre-processed audio files, which should just be a matter of dragging your files in from Finder and dropping them in place. If you’re using recordings from multiple sources (like two hosts that record their own end of a Skype call), you might discover that the dialogue is out of sync, causing hosts to be speaking out of turn, or having different conversations at the same time. To fix this you need to line up your tracks. The best way to nail this is to use a combined recording, which can be made using Piezo or Audio Hijack to record the audio directly from Skype (during your recording session, obviously). This will give you an extra audio file that you can drop in, use to line up your various tracks, and then remove once you’re happy. Once you’ve got it all lined up, cut the overhanging bits off of the start and end. I’ll usually take the time to find the start and end of the actual episode, and cut all of my tracks at those to points, removing the excess audio so that I’m left with just the relevant dialogue. I find the fastest way to get through the actual editing is to do it in passes. Looping over a 5-10 minute segment a couple times, I first remove all the bits I no longer want, stitch it all back together, and then listening through and making adjustments as I go. Jake recalls a story about Steve Jobs and his robot factory. In my first pass, I’ll remove any silence from the track that isn’t speaking. Because Jake and I record in the same room, we can get a little bit of cross-contamination which gives the audio a bit of an echo. This step also ensures that there’s no weird breathing happening while people are speaking. I should note that I don’t remove every instance of those first three things. Sometimes they add to tone, or character. The key is to remove the ones where they stop the natural flow. Sometimes this is obvious (like my giant “um” when I first start speaking), but if you’re not sure, leave it in for now. Performed some pretty major surgery on Jake’s story. 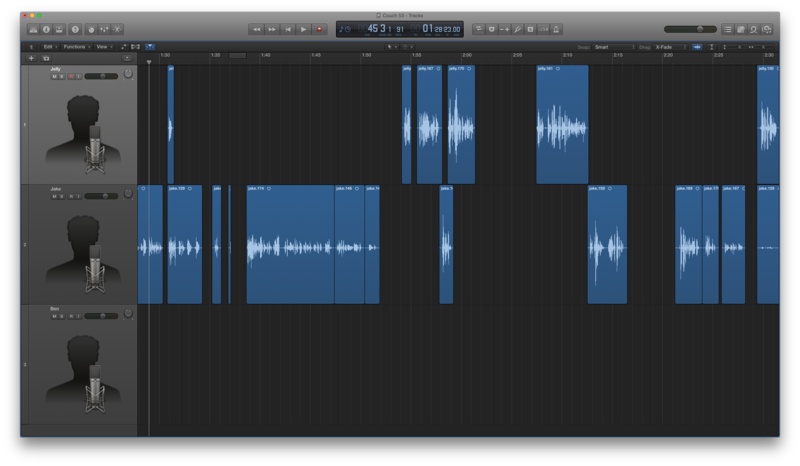 Note the three additional cuts that I made without removing audio, and the small part of the pause I removed towards the end of the segment. I make these so I can reduce the length of these pauses, making the sentence sound a little more fast-paced. Again, I don’t remove all the silence at these points, all I do is remove enough to tighten them up. Once I get far enough, I’ll stop listening to the audio and go back and stitch up all the spaces between the blocks. To do this I simply drag them all forward and crossfade between them (for Logic you’ll need to enable “Advanced Tools” in preferences and then switch the drag mode to “X-Fade” in the top right of your editor). Don’t crossfade into words if at all possible. Leave enough silence for crossfading between the blocks, and if you must (because there was a harsh breath right before or following a word), keep the crossfade short to ensure it sounds natural. Apparently we lost 20 whole seconds with that edit. Dang! I’d consider that a huge improvement. I haven’t dramatically altered the overall feel of the story, and it sounds pretty natural. I’d almost argue that it sounds more natural than the original. I’ll take that as a win. 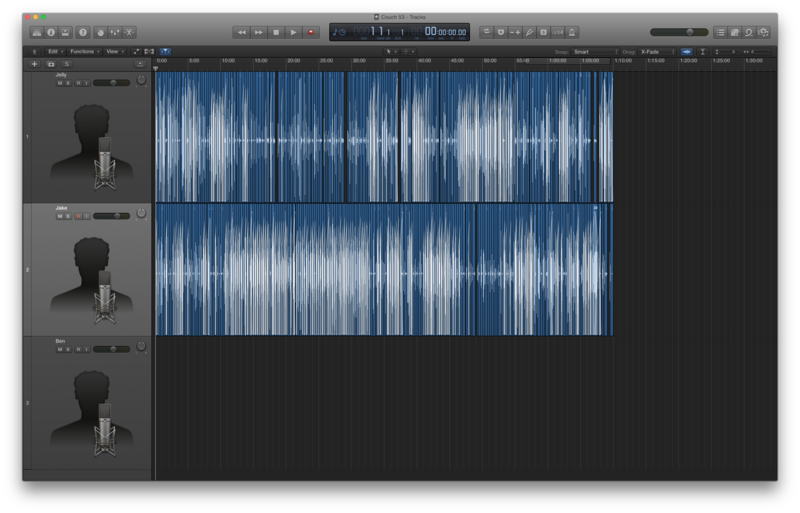 Once you’re happy, you can move on to the next segment, and repeat this process until you run out of audio. 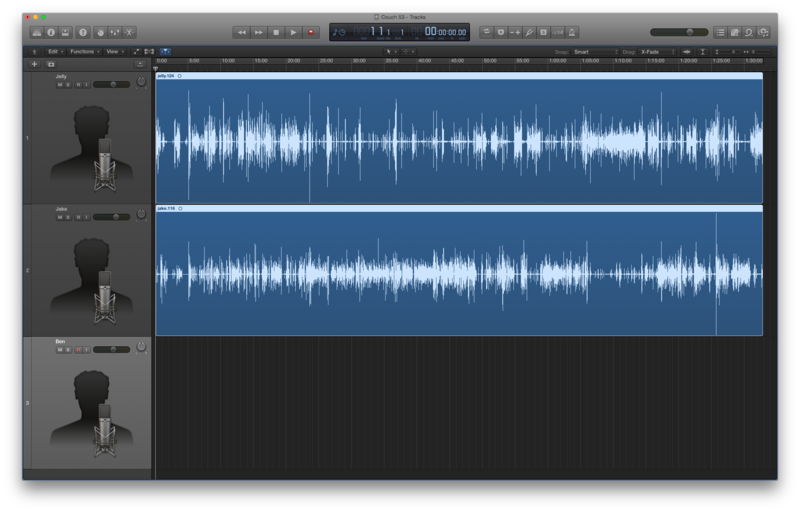 The final version of Mobile Couch 53 in Logic Pro X. What you should end up with is a better sounding show, and likely shorter too! I cut 23 minutes out of this episode of Mobile Couch, and I didn’t even remove any actual conversations. There’s a few more tricks that I have up my sleeve (which I’ll share soon), but with a bit of practice, you should be able to achieve a similar result.